The Volkswagen Golf GTI is famous for combining performance without sacrificing practicality. 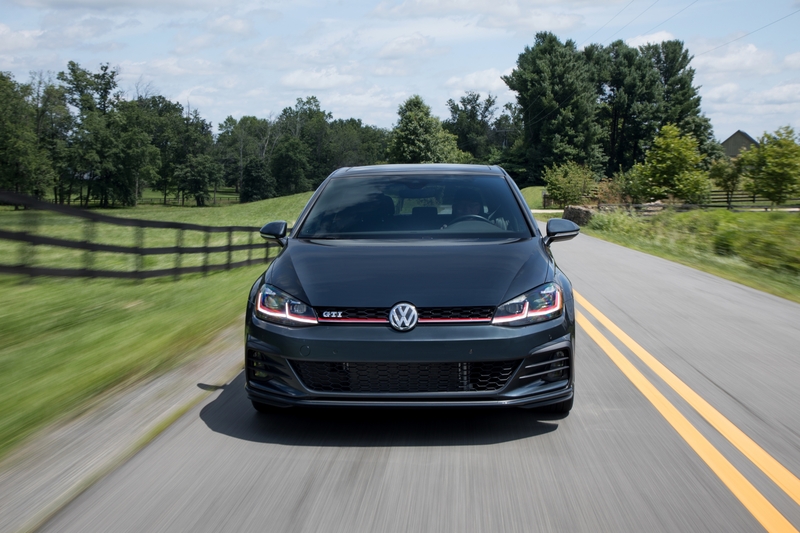 By thoughtfully integrating performance upgrades into the efficient and roomy Golf platform, the brand has been able to build a reputation for the GTI has as a fun car with few compromises and a reasonable price. For 2019 Volkswagen made some trim line changes and added more horsepower and more powerful brakes as standard equipment across the line. Let’s build one of these storied GTI’s to find the best balance of features, performance, value and style. Starting with trim levels, shoppers have five to choose from. The base S has all of the essentials and includes the signature Clark Plaid cloth seat coverings that have become emblematic of the GTI among car enthusiasts. Style and convenience features are available on the new Rabbit Edition, which includes LED headlights and keyless access with push-button start. Also included are stylish dark wheels. Unfortunately, only a few exterior colors are available for the Rabbit Edition. However, the vivid Cornflower Blue is quite eye-catching. Move up to the SE and luxuries like leather seating surfaces, a panoramic moonroof and 8″ touchscreen come standard. Although the SE’s interior is less charming without the plaid, the amenities make for a more comfortable cabin that will make the GTI better suited for the long haul. With a starting price of $31,795, the Golf GTI SE is reasonably priced and very well-equipped, making it the pick of the litter. The top-end Autobahn model costs over four grand more and adds features that aren’t exactly must-haves. We’ll proceed with the SE and continue with the build. With the Golf GTI in SE trim shoppers have access to a fairly wide range of colors. A standout paint color that was added for the 2018 model year is Great Falls Green Metallic, which is a rich medium green that nicely fits the GTI’s understated and somewhat quirky personality. Let’s go with that and move on to the interior. Within the cabin shoppers can choose from any color as long as it’s black, Titan Black to be specific. Red stitching contrasts nicely with the black leather and creates a cohesive look by matching with the red trim found throughout the exterior. It would be awfully nice if Volkswagen was able to add at least some plaid trim to the leather interior, perhaps with door inserts. As with the base Golf, the Golf GTI’s dashboard is straightforward, highly functional and exudes quality. The classic design may not excite like some trendier interior, however the timeless look will never go out of style. Time to shift over to the transmission as we complete the build. Here’s where things get controversial. Purists will say go with the standard manual transmission, which has no added cost and provides a more engaging driving experience. Pragmatists will insist that the 7-speed automatic is more efficient and better adaptable to a variety of driving situations. For today’s build we’ll save some cash and go the traditionalist route with the old-school manual transmission. The next and final stop is options. Volkswagen makes things pretty simple when it comes to selecting options for the 2019 Golf GTI SE. There is only one available, the Experience package. Comprised of a Fender Premium Audio System and DCC adaptive chassis control, this is well worth the $860 investment. $32,690 before fees. Considering the level of equipment and performance packed into the Golf GTI, this represents a very good value for a vehicle that can handle trips to the superstore just as well as bombing down the interstate at sufficient pace. Volkswagen would be well served by leveraging the specialty approach perfected in the Golf GTI, of adding distinctive and significant performance updates to core models, by scaling it across their lineup. Outfit the Tiguan with Clark Plaid seats and drop in major engine and brake upgrades and it’ll be everything that the Tiguan R-Line simply isn’t. Call it the Tiguan TGI and capture market share from the Mazda CX-5 and Volvo XC60. Which Generation Mercedes-Benz S-Class Looks Best? Copyright © 2019	Third Auto Omnimedia Inc. All rights reserved.